It’s time for another installment of my Creating a Cover series. 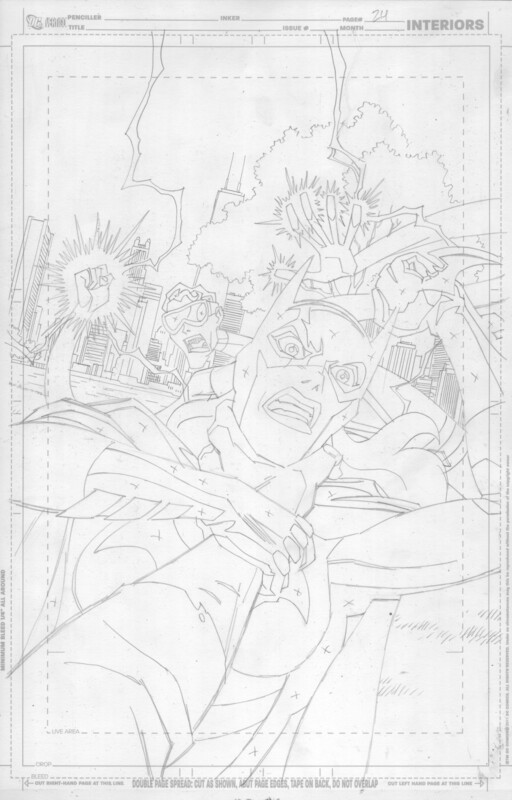 As usual, this cover was being designed before I had seen the script for the issue in question, let alone had drawn it, so a suggestion from series writer Greg Weisman was key in figuring out a cover concept. 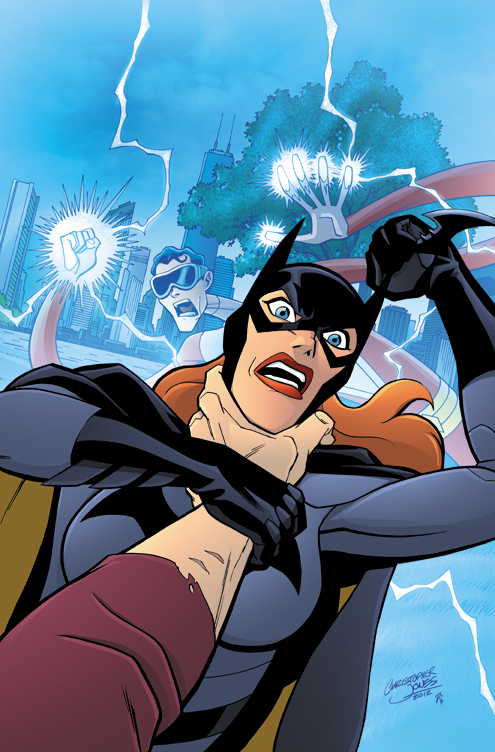 Greg suggested Batgirl being grabbed by the throat by an arm belonging to the yet-to-be-revealed Match in his mutated “Bizarro” form. 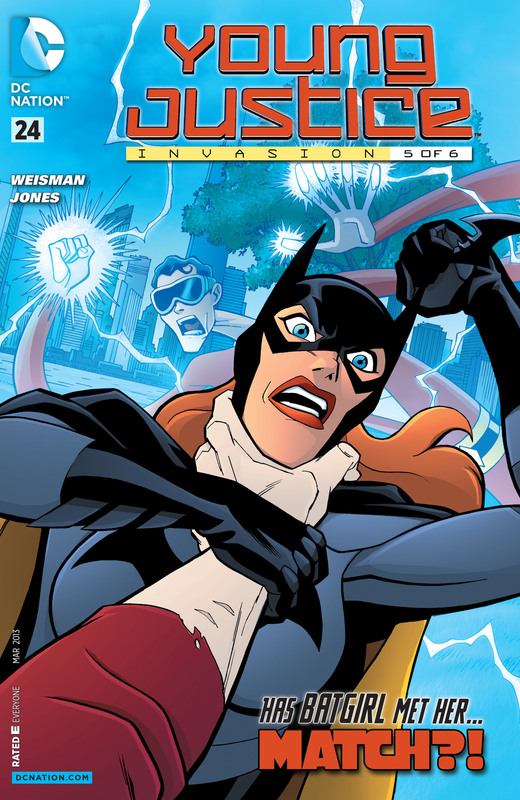 Behind them, would be Plastic Man, helpless to intervene behind the force-field barrier cutting off central Metropolis from the outside world. We had wanted to hide Match’s identity/appearance on this cover, because while he was revealed in the previous issue, this cover would be made public as part of the solicitation for the issue before that had happened, so a shot from Match’s point of view seemed the most effective. 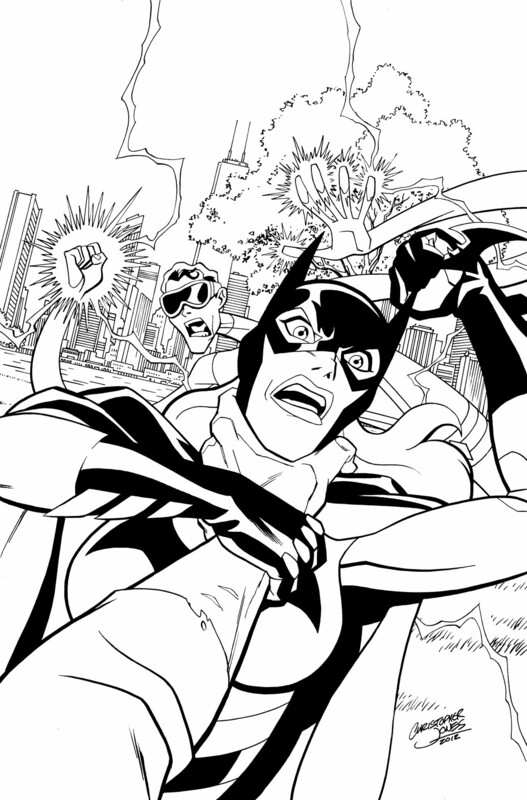 My next priority was to get Plastic Man and Batgirl as large in the frame as possible, as we were more concerned with the characters and their expressions than the setting. 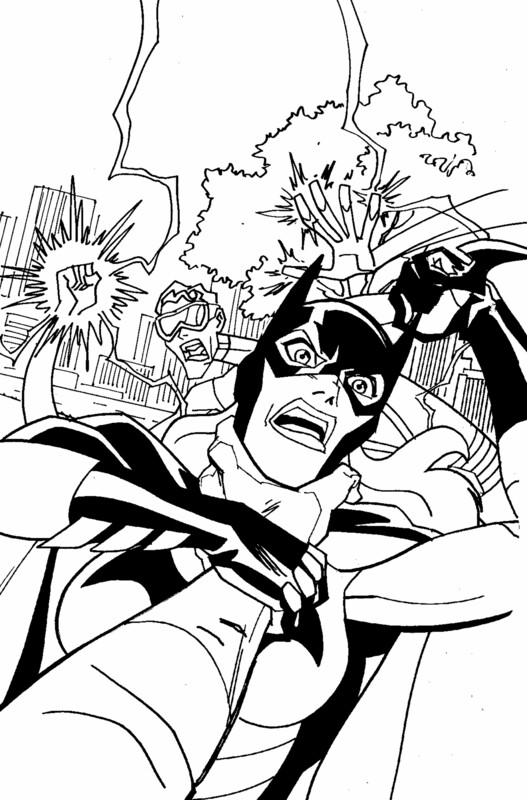 The first sketch was well received, but Greg wanted Batgirl to look more aggressive and less victimized, so a second sketch with an angrier expression and a Batarang clutched in her hand as a weapon was added. I had to shrink the Batgirl figure down a bit to have room for her hand with the Batarang in the frame. 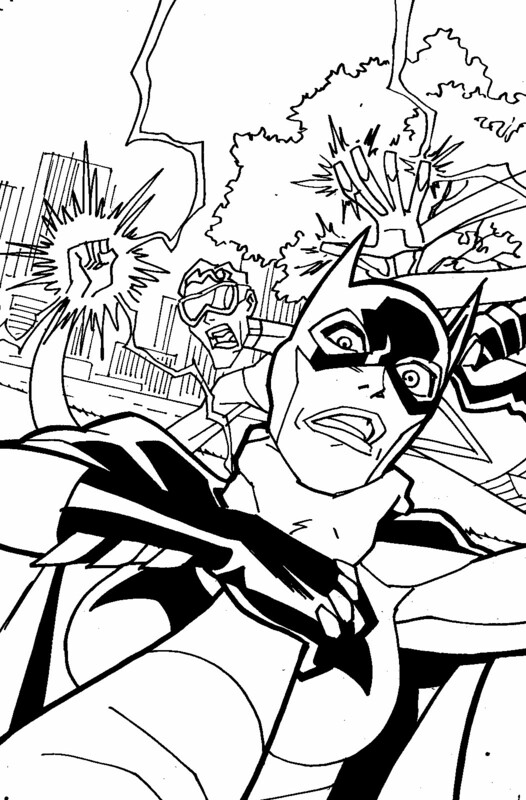 I tweaked a few other things while I was redrawing, such as the pattern of lighting and shadows on Batgirl’s mask, and I realized that I hadn’t had Batgirl’s hair visible in the first version, so I rectified that as well. The layout drawing was tight enough that progressing to pencils and then inks was pretty simple. It’s always nice when penciling to know you’ll be inking your own work. While my pencils are still pretty tight, I don’t have to much thought to line weight or texture at this stage, since I’ll be making those choices myself rather than having to indicated it for another artist in the pencils. On the left is the first draft of color by Zac Atkinson. Zac did his usual great job, but we wanted Match’s arm to be a little more pale and chalky – not as completely bleached-white as a full-on Bizarro form, but far enough to be noticeably paler that Batgirl and to provide strong contrast with his original skin tone. On the right you can see the finished color as it appeared on the published cover, along with all the final logos and other trade dress.